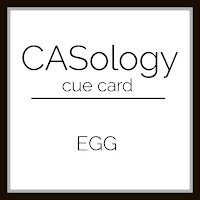 Here is Jenni's card that serves as our inspiration for Muse 154. I love all that yellow, it is my favorite color. The stripes, the color and the three panels provided the inspiration for my card. I pulled out an older Simon Says Set - Circle Friends along with the Tri Circle die. My stamping is done on a white panel on the card interior, and then some tone on tone stamping along with the sentiment on the card front. I colored the bee with WOS markers in black and yellow. I added a bit of Sakura Clear Jelly Roll to the wings. A couple of blogs that had an extended time period shut down at the end of the year. I was looking for at least one more to give me some play time flexibility. From Greta's blog I found Words 2 Craft by. I kinda liked the idea of a written inspiration. So here is my first entry of what I hope will be many. Our words for this month come from American author and humorist Mark Twain. A hand to hold in yours through each tomorrow. While many may only see romantic love here, I see the love of friendship. I value and love my girlfriends. I love and adore my hubby, but sometimes a girl just needs girl time. Supplies include Distress ink -Tumbled Glass, Waves Stencil by SSS, Hero Arts Live Life stamp set, PPP bubbles, and Zig Clean Color Markers. Treasure Chest is hand drawn. Lydia has a floral challenge. I have one set of images from Winnie and Walter, and its full of flowers (Addie's Garden). The tulip images are my favorites, being a spring baby I love tulips and daffodils. Taheera has an image inspiration challenge for us. 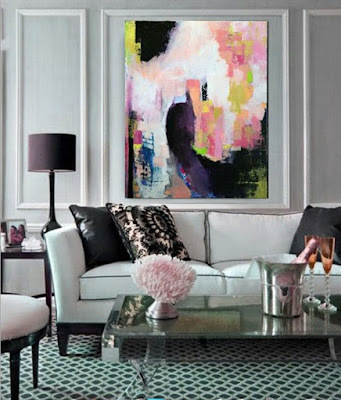 That painting in the background is pretty fabulous, so is that big fluffy pink flower on the table. Those are my inspirations. Gayatri's challenge is to create your own background. Mayuri hosts the inlaid die cutting challenge. This is such a fun technique. Heather has the watercolor plus gold challenge. Gold embossing, and soft water colors...what could be more fun? I have finally gotten my hand on some Winnie and Walter stamps and dies. So I am thrilled to participate in their belated 2nd Birthday Bash. This card is for the Rainbow Challenge with Vanessa. Playing along with Anything But a Card Challenge with Kate. I have always been a reader. While hubs and I courted cross country I relied on my Kindle. Now that I have settled down I love going to the library to pick up hard backed books for reading. I have a goal to read 1 book a week and so far this year I am on target. So what would be more useful than a sweet bookmark? 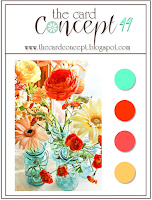 This is for the color challenge to incorporate coral, lime/chartreuse and aqua/light turquoise. Make a new project using the number 2 or two, two colors, two patterns, two layers, two embellishments, two photos, two words or two stamp sets (and so on)...really anyway to incorporate two into your project! I chose two colors and two layers. I am trying to get a jump on birthday cards this year, so I am not rushing to get them to the mail. 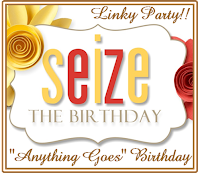 Seize the Birthday has Cupcakes or Candy as their topping to the usual Anything Goes Birthday challenge. I pulled out the Simon Says Stamp Birthday circle die, conveniently it has a cup cake center. Both the outer circle and the cupcake were colored with distress inks, and then the frosting was decorated with some ultra fine transparent crystal glitter. To keep the card base from being to flat, I dry embossed it with the Dotted embossing folder from WRMK. How could I resist playing with this lovely inspiration from The Card Concept #49. And since there is a lot of stamping going on, I am also playing along at Addicted to Stamps and More. I took out a new set from CTMH, its a layering set. I used several inks by Hero Arts and Simon Says Stamp. I love the blue bricks behind the little cluster. The sentiment comes from the same set - Beloved Bouquet. 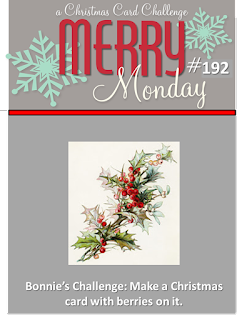 This one is for Merry Monday #192. Die cut sentiment, holly leaves and berries were all colored with T01 copic to give them some depth against the white card. The berries were given an additional coating of red WOS and a dab of glossy accents. After all this challenge is all about the berries! To ground the whole thing a bit I added a dashed line with a Paper Smooches die. 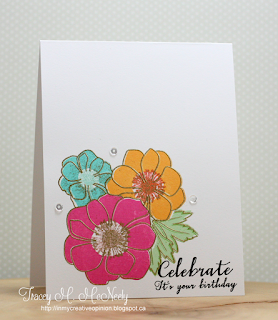 Tracey has given us a sweet trio of blooms for this week's Muse challenge. I loved the cluster and the gold embossed outlines. Those were my inspirations. I made a smaller note card. It is about 3 x 3.75 inches. I wanted my smaller flowers to have about the same space as Tracey's large blooms. I heat embossed my sentiment and flower centers in gold to bring that warm touch to the card. My inks were a combination of Simon Says and Hero Arts. The images are from Simon Says, and the sentiment from CTMH. This Saturday afternoon (at least on the east coast) Linda hosted a scramble in the Hero Arts Flickr group. Her theme was flowers and insects. Hero Arts is also having a fabulous flowers challenge through the end of the month. 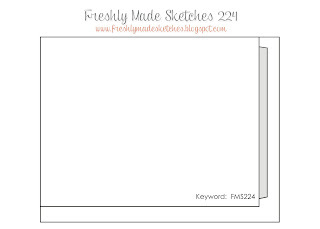 I decided to use the sketch at freshly made sketches. We have 90 minutes to design, produce, photograph and upload our cards. The time limit is good, it forces one to focus. I love these scrambles when my mojo is low. I unintentionally made two cards. I started the first one shown below, and wasn't happy with where it seemed to be going. So I started the second one below. Once that was finished, I went back to the first and played a bit, and ended up liking it as well. Some watercoloring, some vellum, some stickles, an embossed sentiment and some layers. I had fun with this card. Sent off to a blogging friend that surprised me with some stamps. Thank you so much! I've been having a bit of mojo-less-ness. It is aggravating, I have plenty of stamps to play with...so it's challenge time. I like that bit of direction. This card is for the AEIHeartU Challenge 33 Friendship over at Avery Elle. This Peonies set is perfect for a girl-friend card. I may have to make some multiples of this one. I originally was going to mount it on pink, but then tried this aqua/teal/light blue and it really made me smile when I changed it up. I used copic markers for the coloring, and added a few tiny gems for a little bit of bling. I wanted to try some no line coloring. I bought this Avery Elle stamp last year too late for the Easter creations. So this is my first shot playing with it. I stamped it in SSS Fog ink and colored with copic markers. Then I cut around the image with an oval die from MFT. The card based was dry embossed and a couple of epoxy hearts frame the main image. Here is a card I am sharing in the Share Joy Challenge #22 a sketch + Inspiration challenge. I've taken my inspiration a little from the sketch, and a little from the photo. I am sending it to a friend and former co-worker of mine who is still working. She is a coffee lover and enjoys puns, so I am hoping this will lighten her day a bit. Circle-MFT, Papers by SU. Card Size 3.5 by 5 inches. The challenge over at Essentials by Ellen for the February Mix it up highlights Essentials by Ellen and Penny Black brands. 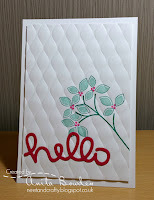 I used Essentials by Ellen's Merry and Bright die cuts, and Penny Black' s Delightful---well about the top half of it. This is a note card sized card 3.5 by 5 inches. Sometimes those cute smaller cards are the best "just because' cards. Have you played along in the mix it up challenge? As it happens, I just got that same embossing folder and I need a birthday card. Anita's card inspired me to use the embossing folder, a die cut and a cluster image with just two colors other than white. I had the most fun playing with this die from Poppy Stamps and some fun foam. So many different looks depending on which pieces I chose to leave in the frame. Thanks so much for stopping by, and may your Valentine's Day be filled with the things and people who make you happy! Some relaxing coloring, and sentiment treatment done a la Kelly Latevola. I love the way she outlines in white gel pen the overlapping sentiment on a one layer card. Check our her beautiful coloring here. This birthday card is for Greta, she has been getting a lot of cards from me lately. The flowers are from Stampendous, the greeting from CTMH. Copic markers, a bit of bling and a colored base. Hope you had a fabulous day Greta!